Why We Minister: Fr. Jim Bracke, C.S.C. Wednesday, May 16, 2018, was an amazing day. I was able to celebrate my Godson Joey’s graduation from Pine Creek High School in Colorado Springs, Colorado. As Joey walked across the stage on a sunny Colorado day, I beamed with joy as I flashed back to the many fond memories I have with him: watching him learn to walk, fall and skin his knees, showing him around the Notre Dame campus, exploring the Science Museum in Chicago, hiking the Rockies, his First Communion and Confirmation, experiencing the ups and downs of school, sharing our love for music, and attending his band competition- just to name a few. As he walked down the steps of the stage, he was all smiles and filled with excitement for his next step of attending college at Colorado State in Fort Collins. Joey and I were later shown a photo of me holding him at his Baptism. Joey blushed and I was shocked by how young I looked with a beard and thin frame. Where does time go? I’ve been thinking a lot lately about how I have been held by God, even now. It is never too late to let yourself be loved by God. Fr. 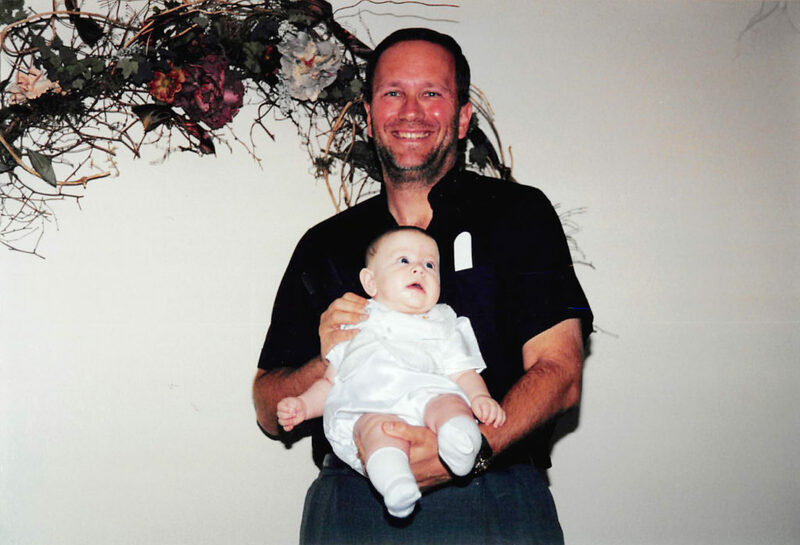 Jim holding his Godson, Joey, at his baptism on an Air Force Base near Sacramento, California, February 2000. Jesus became human and can identify that we have our ups and downs. He cried at the death of his friend Lazarus, was angry when the temple officials cheated the poor, was frustrated when the disciples did not understand that he came to serve and wash feet, and was not going to establish a political kingdom where the Jews would be prosperous and on top. Jesus sweat blood at the thought of his cross and the pain and torture he would soon experience. He enjoyed meals and weddings, and loved being with friends just as you and I do. Jesus also felt he was held by God and we know this from scripture. After Jesus was baptized by John the Baptist, God said, “You are my Beloved Son and with you I am well pleased.” On Mount Tabor, shortly before he was heading to Jerusalem where Jesus would suffer and die, God appeared to Peter, James, and John and again voiced, “Listen to Jesus, with Him I am well pleased.” In prayer, Jesus opened his heart to share his thoughts and feelings with God. He would feel God holding him and assuring that he was there to walk with him through the disappointments, the grief in losing Lazarus, the frustration in the disciples and even his own family’s lack of knowing who he really was. I love being a priest and have been serving God and God’s People for over 38 years. I love serving the 5,000 children of God here at Notre Dame for the past 5 years. Yet, I have also had many ups and downs over the years. I’ve felt the sting of grief when my mother and father died and I still miss them dearly. My brother, Tom, and sister, Barb, are very dear to me along with their children and grandchildren. They have all loved me over and over again- I am deeply blessed. On the other hand, I have also been hurt by the people I have served and call family, and I have experienced depression and loneliness along the way. However, I have always been able to be open with God and share these thoughts and feelings. Sometimes God seems distant and I feel like I am in a desert just as Jesus was. I have felt temptation, but honestly, I have never felt abandoned or rejected by God. Our God is a God of love. Fr. 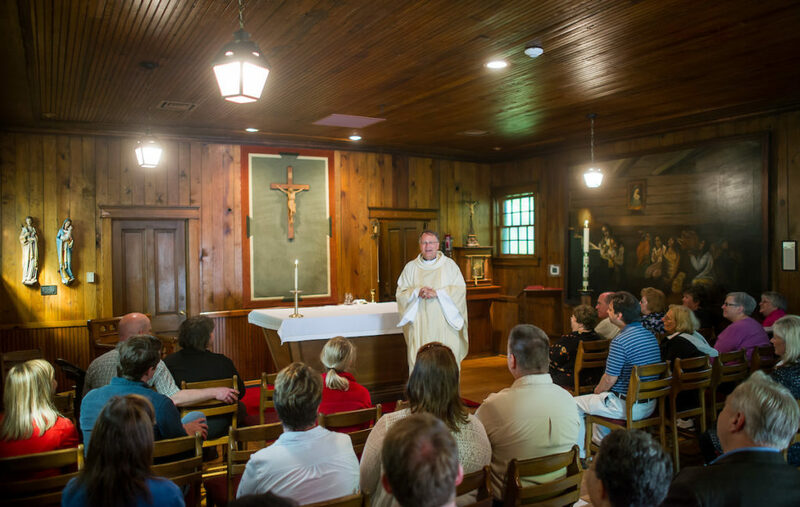 Jim preaching at a Staff Mass in the Log Chapel. As University Staff Chaplain, I was recently talking with a staff member who shared that he grew up with a very fearful sense of a God who would be out to punish if you did not obey the commandments or follow the laws of the Church. His pastor spoke only about a God who judge’s people and never talked about a God who forgives or gives people hope in Christ. It is my mission to share this hope. The blessing of Spiritual Companions have helped me to come back to God and open my heart. Sometimes family, friends, or often a stranger would say to me after Mass “Father, this parish is one of the most welcoming I have ever attended. I have loved your homilies and your leadership is outstanding. I am joining.” A message such as this came at a time when I was struggling for a number of reasons. I believe in Divine Providence and that God sends us people and events that are not just coincidence but God’s way of saying, “I am with you and holding you” as if you were an infant- even if you are 66 years old. This is why I continue to minister.